Lucky Strike Frank Brown Ad 1940 This is an November 11, 1940 advertisement. It is a nice color ad from The American Tobacco Co., makers of Lucky Strike cigarettes. Pictured is Frank Brown, tobacco warehouseman showing a visitor some of the fine golden leaf that is Sold American to Luckies. In mint condition. Photo is taken through plastic and may show wrinkles or crookedness that is not in the ad. This magazine tear sheet measures 9 1/2"" wide by 12 1/4"" tall. 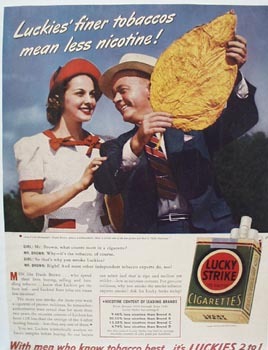 Items Similar To "Lucky Strike Frank Brown Ad 1940"